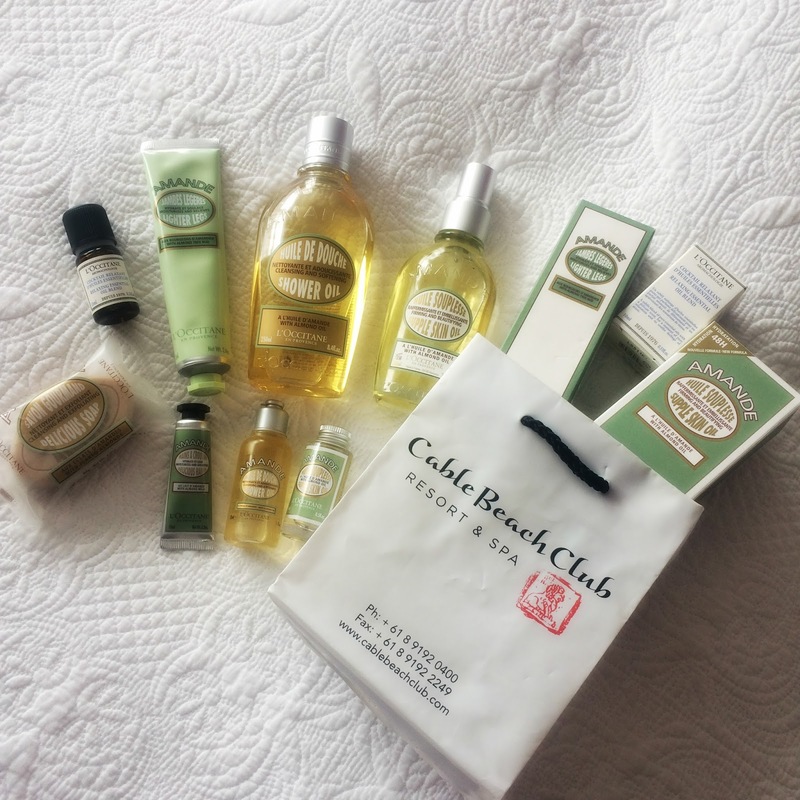 Today I am sharing with you my experience of the Chahoya Spa by L'Occitane at the Cable Beach Club Resort and Spa in Broome, Australia. 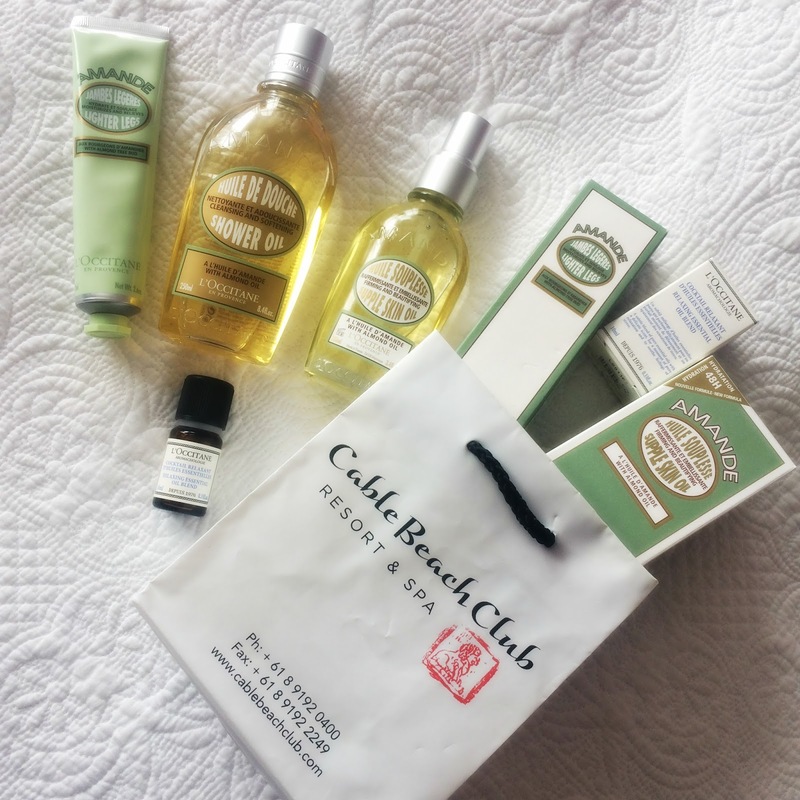 You may recall seeing on my Instagram that I visited Broome in October to attend a family wedding and for some quality R & R.
While there I took the opportunity to try out the resort spa for a number of reasons, including my love for L'Occitane products. As soon as I realised it was a L'Occitane spa, I was in! The treatments I chose were well-needed though. I opted for a leg refresher treatment with essential oils and added on a head massage to finish. We had to take three plane rides to get to Broome and when we arrived it was 40 degrees C and very humid. My feet and legs suffered as a result and bar swimming 24/7 and having cool showers, the only thing that was going to help them was having this treatment. My only regret was that I left it to the end of the trip before I booked in! I added on the head massage for a little extra relaxation. The Spa: Chahoya Spa is named after the Japanese word for 'pamper' and reflects the rich Japanese pearling culture and history in Broome. 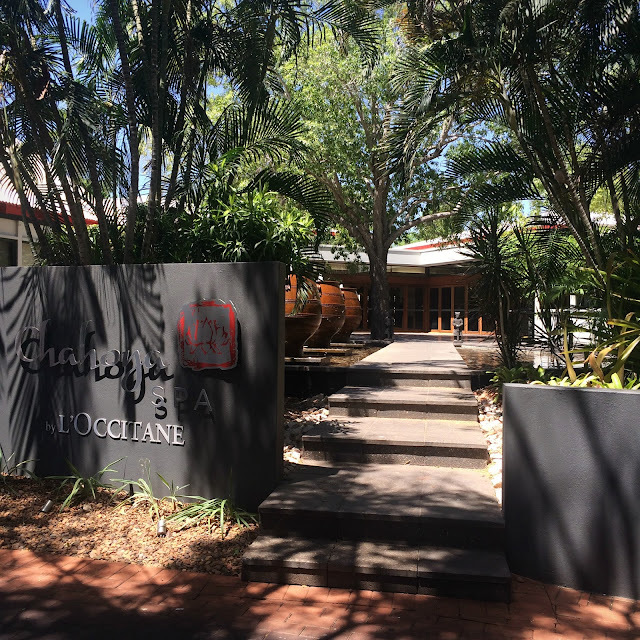 The spa partnered with L'Occitane in 2013 to add Australia to the network of other L'Occitane spas worldwide in exotic locations like Indonesia, The Dominican Republic, Spain and Israel. At the Cable Beach Club Resort and Spa, the spa occupies a tranquil spot to the side of the tennis courts and gym, in a dedicated wellness area. 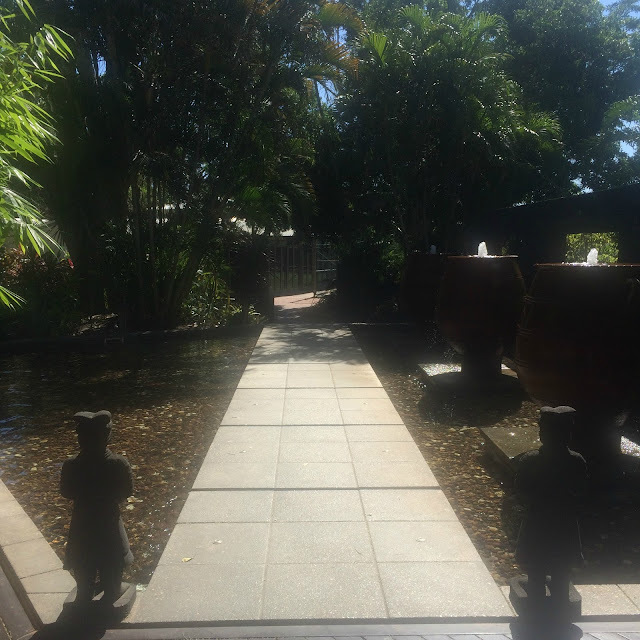 You can see from the images above, how beautiful the spot is and how tranquil the surroundings are with many water features, ponds, bubbling water and leafy palms. The spa itself is very spacious and it encourages a feeling of openness and relaxation. From the moment you step inside and breathe in the L'Occitane scent, you are instantly relaxed and ready for your treatment. It is recommended that you get there 15 minutes early, so that you may fill out the health questionnaire, but so that you can also ease into your treatment without the hustle and bustle of the outside world. Dim (interior) lighting, natural light from the many windows offering views of various water features and sculptures, and comfortable chairs all set the scene for a relaxing treatment. While filling out my questionnaire I was offered a cool face cloth and glass of water to freshen up with; a thoughtful and very welcome touch. My therapist Danae offered a friendly introduction as she escorted me to the Kimberley Cabin, named after the Kimberley region of Australia where Broom is located. 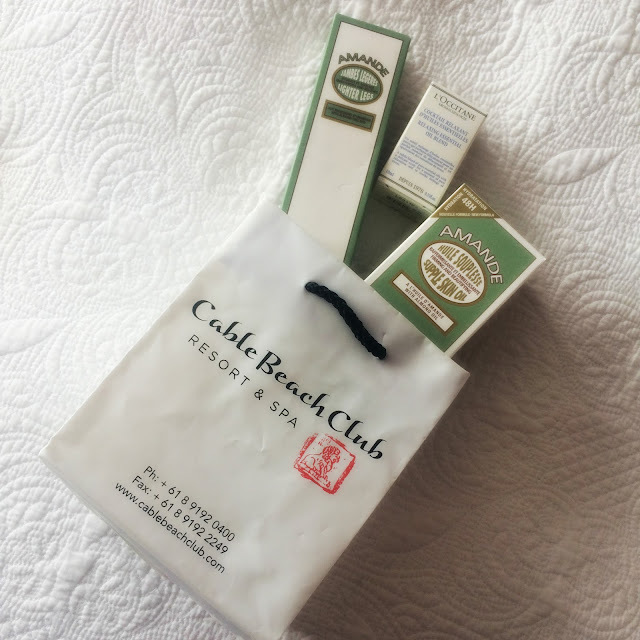 I was first treated to the L'Occitane 'Welcome Ritual' which is a grounding and relaxing foot bath using the Aromochologie Effervescent Sugar Cubes. I was left in private to arrange myself under a towel on the massage bed. Before Danae began the leg massage she asked me to inhale three times slowly what I later learned was the L'Occitane Aromachologie Relaxing Essential Oil Blend. This was as I was laying face-down on the massage bed and very nearly made me fall asleep, it was so calming! I went on to purchase this product for obvious reasons! The massage combined warmed oils and effleurage techniques to boost lymphatic drainage and circulation, with a thicker cream for my feet to nourish dry skin. After my treatment I noticed my legs and feet were noticeably less puffy, especially around my ankles. I don't know about you but my very favourite things to be massaged are my head, feet and hands. Something about massaging the extremities is so nice! I always try to add on a head massage to a treatment where possible. Danae had put out a comb for me to tidy up my hair after the massage which I thought was a nice touch. Sometimes after facials I feel like I am left with a bird's nest on my head if the therapist has included a head massage! After my treatment I was invited to unwind in their relaxation area. I was served cool water, a detox tea from the Kimberley region and a selection of dried fruit and nuts. I did not want to leave the relaxation area as it was so nice and I stayed there for about half an hour. There was a selection of L'Occitane products on the table for me to try also, where I promptly fell in love with the Almond range all over again. Needless to say, quite a few products made it home with me! However I still haven't picked up the Almond Milk Concentrate (it's featured in my Christmas gift guide/wishlist). 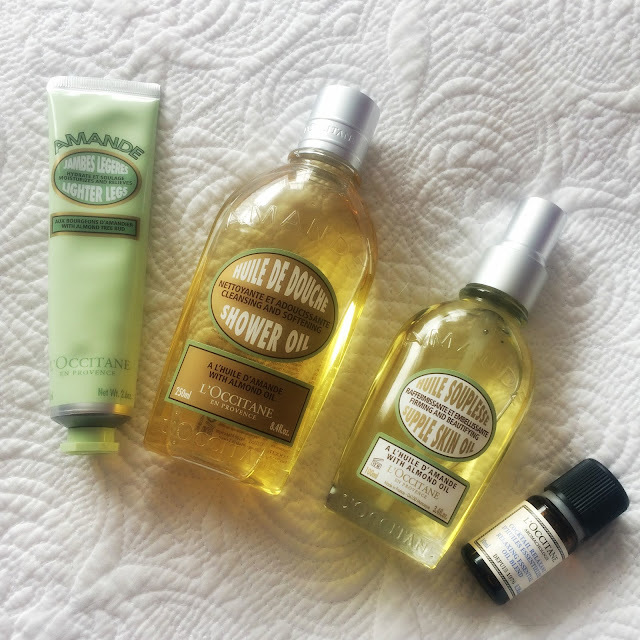 I've been loving all of these products, the shower oil is in my November favourites and the Supple Skin Oil has been a lifesaver for maintaining my holiday tan. The Lighter Legs gel-cream is a brilliant product for tired, heavy 'summer legs' and will be in my travel bag this summer for sure! Have you tried any of these products? Would you visit this spa if you are ever in Broome? I really recommend my therapist Danae too, she was polite, professional and friendly. I thoroughly enjoyed my time at this spa and I hope to do more spa reviews in the future! P.S - I paid for all of my own treatments and products. Chahoya Spa did not know that I was writing this review, nor did they influence what I have written. All opinions are my own.